Traveling cat spotted in Kiev, Ukraine. Awww... such a darling picture! Oh my, this is very cute. I think my eardrums just broke from mom's loud squeeing. Such a cute kitty. Have a super Saturday. So cute! Have a nice week-end. My gosh, this is too cute. Amazing shot! The cat looks so cute. So cute, this put a smile on my face. He (or she) looks like a model. 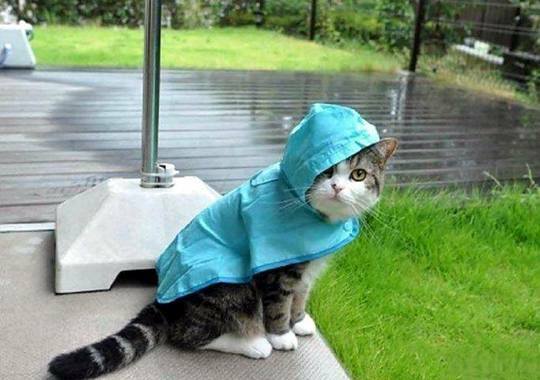 I love the raincoat snd how the hood is at a jaunty angle. ohhhh this is just too adorable! Now that's pretty darn cute.